"Creativity is more than just being different. Anybody can plan weird; that's easy. What's hard is to be as simple as Bach. Making the simple, awesomely simple, that's creativity." 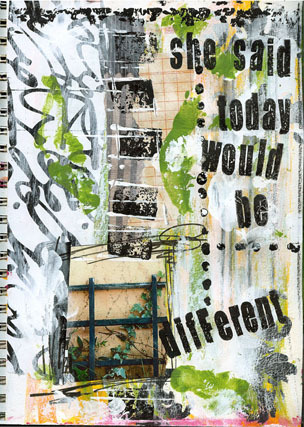 Journal Page Elements: Photo taken in Charleston, SC, collage papers, handmade foam stamp, stencils, acrylics, alphabet stamps, black pen and gesso.